Conifers probably dominated the upland forests since the late Pennsylvanian and have continued to be important components of the vegetation to this day. In the wake of dramatic cooling and drying near the close of the Paleozoic, conifers expanded their range to become dominant elements of tropical and temperate plant communities. Conifers remained ecosystem dominants through most of the Mesozoic, only yielding their position to the diversifying angiosperms in the Cretaceous. Today, a few genera have many species and a widespread distribution (e.g., Pinus, Juniperus, Podocarpus), but many conifer genera occupy relic ranges (e.g., Sequoia, Metasequoia (VG 3:6)). Many conifers are well represented as fossils and their distribution can clearly document the diminution of biogeographic range through the Tertiary. Almost by definition, this lab can only provide a brief overview of ancient and modern conifer form and diversity. Your goal is to get a feel for the range of morphology in foliage, wood, and reproductive structures exhibited by conifers. You should also have a clear understanding what features the conifers share and what unites them into a coherent and natural group. Almost all known conifers (extinct and living) are woody. Most are trees. 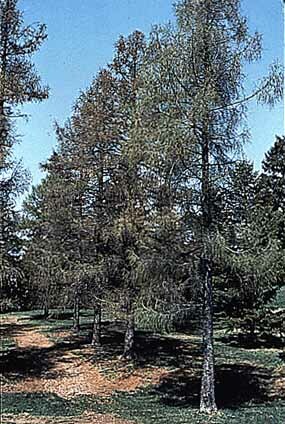 The most common growth form for conifers is a single erect trunk with branches emerging at nearly right angles to the main axis. An important exception is the Taxaceae, which has a less stereotyped branching pattern. Most conifers are evergreen but a few (Larix (VG 3:1) and Metasequoia) are deciduous. The leaves of extant conifers may be needle-like, awl-shaped or flattened. 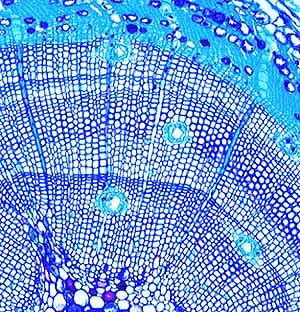 Conifer leaves have parallel veins, a feature that may be derived from a cordaitean of aneurophyte ancestor. Leaves can be arranged along the axis in spirals or decussatly (pairs at right angles to one another). 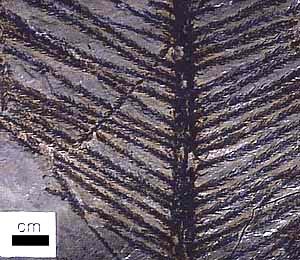 This feature is conserved in the ancient conifers, Lebachia (VG 3:7), Walchia (VG 3:8), and Striatotaxus, of Pennsylvanian and Permian age. It is interesting to note that by the time these taxa turn up in lowland depositional environments, they appear to be perfectly good conifers--no grab-bag of ancestral and derived characters here! This has led to the consensus opinion that the conifers, like many other groups, originated in the less well-preserved "uplands" and then migrated into the moist lowlands after some period of time. In fact, when we find "upland" floras from earlier in the Pennsylvanian, the conifers are there. Primary vascular structure is a eustele. Abundant secondary growth occurs from a bifacial vascular cambium. 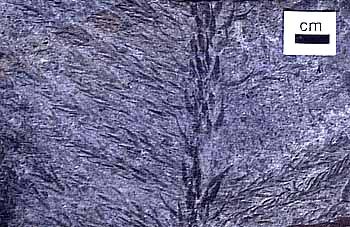 Xylem is composed entirely of tracheids and wood is generally parenchyma poor and thus pycnoxylic (VG 3:2). Tracheids of many conifers have a characteristic circular bordered pitting on element walls. Recall that this feature is not restricted to conifers, but has been useful for distinguishing conifer from other wood taxa in permineralized specimens. As the name implies, the conifers are called conifers because they have cones. In this case, "cone" is a colloquial term for a woody strobilus. As with other strobili we have studied, those of conifers are derived from sporangia-bearing branch systems that have been modified. Extant conifers are most monecious but have differentiated mega- and microsporangiate cones. In ovule-bearing (megasporangiate) cones, ovules (VG 3:3) are attached to a scale in various orientations. The scale, in turn, is subtended by a bract (Figure 9.4) (VG 3:4). It is in the ovule-bearing structures that the homology with Cordaites is best expressed. Florin (1951, 1954) argued that the conifer bract was homologous to the cordaitean leaf subtending the ovule-bearing branch, which he homologized with the ovuliferous scale of conifers. With this interpretation, the entire axis of ovuliferous Cordaianthus can be modified without major rearrangement into the conifer seed cone. Florin argued, therefore, that Cordaites may be the ancestor to the conifers. Florin's homologies seem generally sound, but his evolutionary interpretation is still a topic of debate. You'll note that in the overall phylogeny used to organize the Virtual Paleobotany Laboratory, we leave the node linking Cordaites, Ginkgo and conifers unresolved to express that there is disagreement among current workers and still more research to be done. Figure 9.4: Generalized reproductive structures in conifers. (A) Ovule-bearing cone; (B) detail of cone in longitudinal section; (C) ovuliferous scale with developing ovules viewed from above. (D) Pollen-bearing cone; (E) detail of cone in longitudinal section; (F) microsporangiophyll with pollen sacs viewed from above. Not all conifers produce woody strobili. In some taxa, ovule-bearing structures are reduced to fleshy, berry-like forms (e.g., Juniper, Taxus, Podocarpus). In most cases, these structures are autapomorphies derived in relation to seed dispersers. This variability reminds us that despite a generally stereotyped morphology, conifers have a variety of form that betrays a long and interesting evolutionary history. Pollen-bearing (microsporangiate) cones in conifers differ significantly from their ovule-bearing counterparts (Figure 9.4) (VG 3:5). 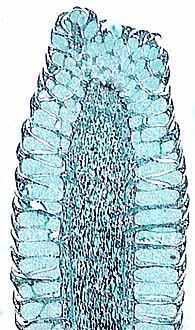 In pollen cones, microsporangia are borne on a single bract without a trace of a second, subtending structure. Note that this is different from Cordaites in which the microsporangia was born on a branch subtended by a bract on a branch system that was subtended by a second order of bract. Thus, the homologies between pollen bearing structures in Cordaites and the conifers are problematic. These homologies, or lack thereof, may present the greatest challenge to Florin's evolutionary interpretations. Many modern conifers produce saccate pollen; bisaccate pollen (Figure 9.5) is common among the pines and close relatives as well as many other Mesozoic seed plants. Other conifers produce pollen with a single bladder -- monosaccate pollen. Sacci are thought to help make large conifer pollen grains buoyant in the air as most are wind pollinated and rely on long-distance pollen transport. Although this generalization is useful, there is substantial diversity among conifer pollen types. Figure 9.5: An example of saccate pollen. Saccate pollen is a primitive character for conifers. Cordaites, glossopterids, Caytonia, Callistophyton, and corystosperms all have this type of pollen. Ginkgo, peltasperms, and anthophytes lack saccate pollen. A variety of Mesozoic and Cenozoic conifers, including Pagiophyllum, Sequoia, and Metasequoia are available for you to study. Note the features you observed in modern foliage and cones. The Mesozoic is the hey-day of conifer diversity and ecological importance. The taxonomic richness that we see today, then, represents a relic. As you consider ancient and modern conifer diversity, think about the factors that may have led to changes in conifer distribution, both geographically and ecologically. One way to organize the variety of extant conifers is to consider the linnean classification currently in use. You'll notice that we've largely avoided hierarchical classifications in this manual, in favor of lineage-based groupings. With respect to conifers, much interesting work on phylogenetic relationships is getting underway and some of those results are included in the classification we present below. For example, the Taxodiaceae, which includes the redwoods, was found to be paraphyletic with the Cupressaceae. As a result, the family Taxodiaceae was subsumed into the Cupressaceae so that the family would represent a monophyletic lineage. This change illustrates one of the important problems of hierarchical classifications. However, they are largely still in use, so we present one version for your consideration. The classification presented below for living conifers is from Taylor and Taylor (1991). There remains, however, much disagreement about the taxonomy of extinct conifers. 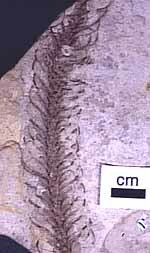 For example, Foster and Gifford (1989) assigns Lebachia and Walchia, two taxa that you will see in this lab, into another order, the Voltziales, but Taylor and Taylor (1991) assign them to the conifer family Utrechtiaceae. Don't let these details of systematics confuse you. The main point is that many of the conifer fossils have unique character combinations that are not seen in living conifers. As with other groups, these novel character combinations provide the opportunity to apply phylogenetic methods in order to understand the evolutionary and biogeographic history of this group. Note: Biogeographic distributions are given for extant taxa only. Fossil taxa of some of these groups had different global distributions in the past; for example fossils assigned to the Araucariaceae (VG 3:9)are known from both hemispheres.